Emergency crews were called to the scene in Aberdeenshire on Wednesday. Two people have been seriously injured in a three-car smash in Aberdeenshire. 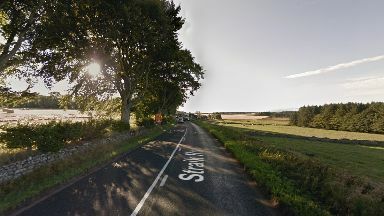 Emergency crews were called out to the scene of the crash on the A944 near Kirkton of Skene on Wednesday at around 5.50pm. A White Range Rover Evoque, a blue Vauxhall Astra and a grey Audi A4 were all involved in the collision. A 46-year-old man and a 60-year-old woman were taken to hospital and are being treated for serious injuries. A 71-year-old man was not injured following the smash. Constable Dan Baird, from the Road Policing Unit, said: "Enquiries into the circumstances of the incident are at an early stage. "I am appealing to anyone who witnessed the incident or saw the white Range Rover Evoque, the blue Vauxhall Astra or the Grey Audi A4 prior to the incident to contact Police Scotland."